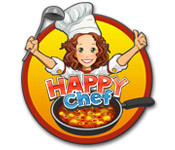 Develop expert culinary skills in Happy Chef, a gripping Time Management game with tons of different dishes! Take command of the kitchen and demonstrate the skills of a master chef. 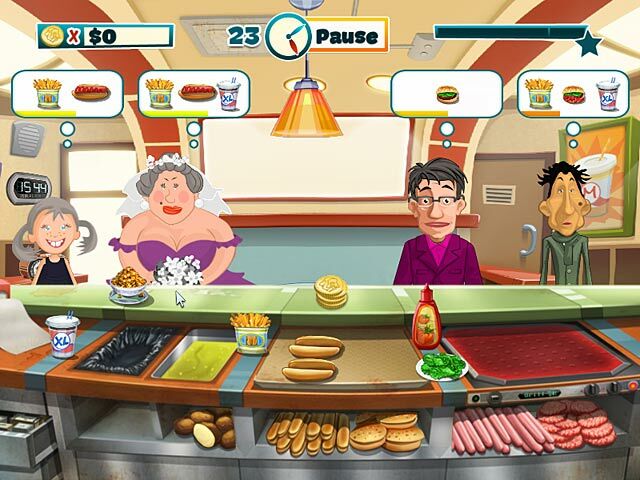 Start with hamburgers and hot dogs and work your way to becoming the best known restaurant in the country! 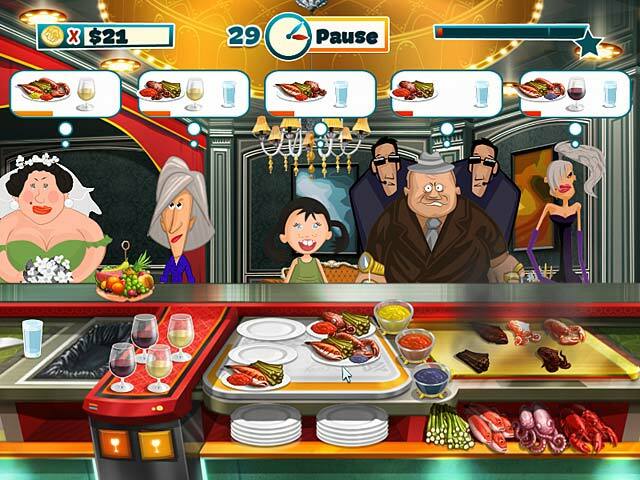 Decorate your restaurant, buy new furniture, find awesome accessories, and upgrade your kitchen to become a Happy Chef! 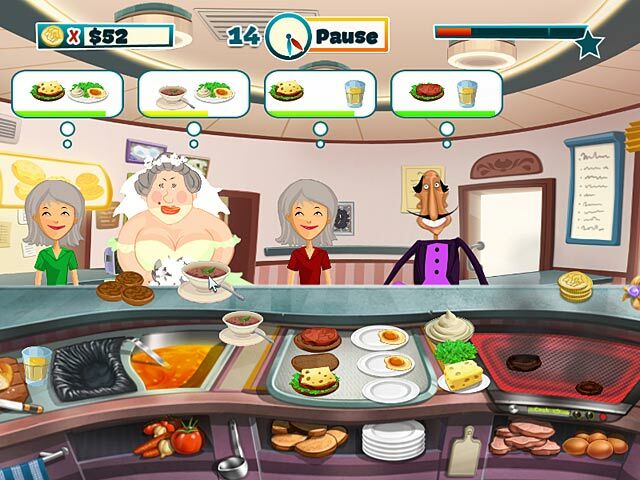 Happy Chef is rated 3.4 out of 5 by 75. Rated 5 out of 5 by sweetoneinpa from Fun cooking game! I love this game!! It's the best cooking game I have ever played. I beat it and then start all over..love love love it!!!! Rated 5 out of 5 by insaneheadspace from Lots of fun and some real challenges! Forgot I had played this game AGES ago. Played it again (and clocked it) over the last few days. It was just as fun (and sometimes, as frustrating haha) the second time around. I like that there is a huge variety in the meals you prepare. I see there is a Happy Chef 2, so I'll be buying that now! Rated 5 out of 5 by libradream from Awesome I am addicted to tm games and thtis one doesn't disappoint. Rated 5 out of 5 by ReeseDixon from Actually requires strategy! Time Management game that's actually challenging. Loved it. Hoping for a sequel. Rated 5 out of 5 by Armyscout1 from Awesome game This game was so much fun..keep these kind coming. Rated 5 out of 5 by LuAnnHD from Need More Games Like This One! Awesome! Very good game! Please make more of them! Rated 5 out of 5 by DonnyDJ from Highly Underrated Excellent game for people who miss the old school time management games that have fast clicks. I almost didn't try this one due to poor reviews from other players but I am glad I did. For people who want a fast paced challenge. Rated 5 out of 5 by FORTUNATUS from FUN, addicting and may make you hungry.... Based on FULL demo: I truly enjoyed this game and am purchasing it. Not too challenging at all (as YET). I finished the demo up to through the breakfast cafe and am still loving it. I am suddenly hungry for fast food tho, lol (and I seldom, if ever actually eat it! ), hmmm. So... here's my input for the demo and now off to buy during Felix sale. Rated 5 out of 5 by bigdee35 from EXCELLENT!!!!!! I LOVE THIS GAME ITS SO DIFFERENT FROM THE OTHERS!! !